Other Products by Amazonia. Search other Digestive Health products. 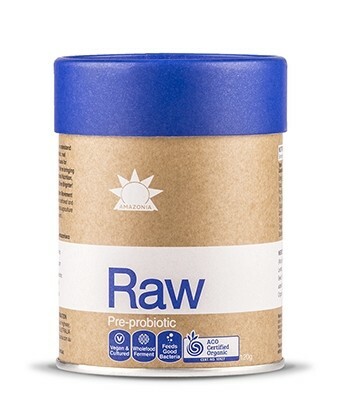 Amazonia RAW Pre-Biotic is contains 5 probiotic strains, along with prebiotics and fermented wholefoods. This makes it a unique formula to assist with general digestive health. Prebiotics aren't as well known as probiotics- the beneficial bacteria that live with us within our gastrointestinal tract. Prebiotics are the feeders of probiotics. Just as we need food to survive, so to do probiotics. Prebiotics assist in improving the amount of beneficial bacteria as well as their activity. We are literally on the verge of understanding a great deal more about just how important probiotics are for our health. Scientific research is focusing more and more on this complex area, with each study revealing intruiging and exciting results. These beneficial cultures really are essential regulators of our wellbeing. Amazonia are the creators of some of the most popular organic wellness products on the market today. They are used by sports and exercise enthusiasts, vegans and vegetarians, and people with dairy allergies or lactose intolerance issues. Supporting digestive health is perhaps the most important focus for anyone wanting to improve general health and wellbeing. Without good digestion, we simply do not absorb nutrients very efficiently. This scenario also leaves us open to the growth of unwanted pathogenic bacteria and digestive issues such as bloating and gas. Good Digestion really is the cornerstone of holistic health! 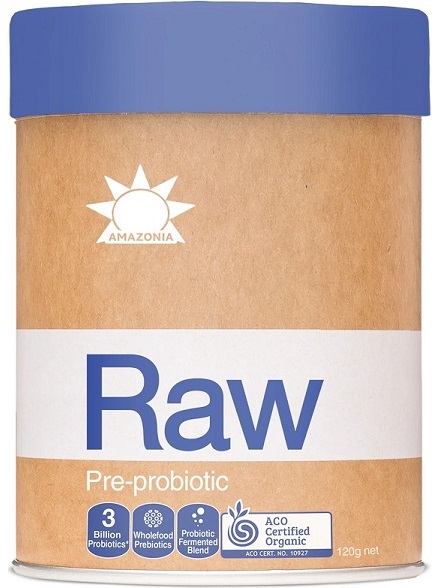 Amazonia RAW Pre-Biotic a fantastic product that can easily find a home in the kitchen of anyone interested in wellbeing. Mix 5g (2 tsp) into 200ml cold water or non-dairy milk. For kids aged 12-17 years, take half the adult serve.This product works well mixed into smoothies, breakfast bowls and protein shakes. INGREDIENTS: Organic Fermented Blend* (Mung Beans*, Brown Rice*, Red Lentils*, Chickpeas*, Flaxseed*, Alfalfa Seed*, Millet* & Quinoa* [<0.05% Agave added for the fermentation process]), Organic Baobab Powder*, Organic Jerusalem Artichoke* (prebiotic), Organic Lucuma Powder*, Organic Mesquite Powder*, Natural Vanilla Flavour, Natural Berry Flavour, Organic Stevia Leaf Extract*.